At the end of the summer Sean and I always take the boys on a local vacation, often in Michigan or Wisconsin. 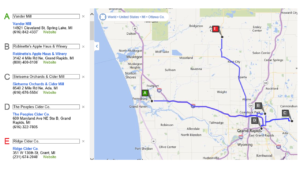 This year we decided to visit the Grand Rapids Metropolitan Area located in Western Michigan. Michigan is home to numerous orchards and there are a number of Michigan cideries that are producing hard cider. Grand Rapids is no different with several craft cideries in the area. 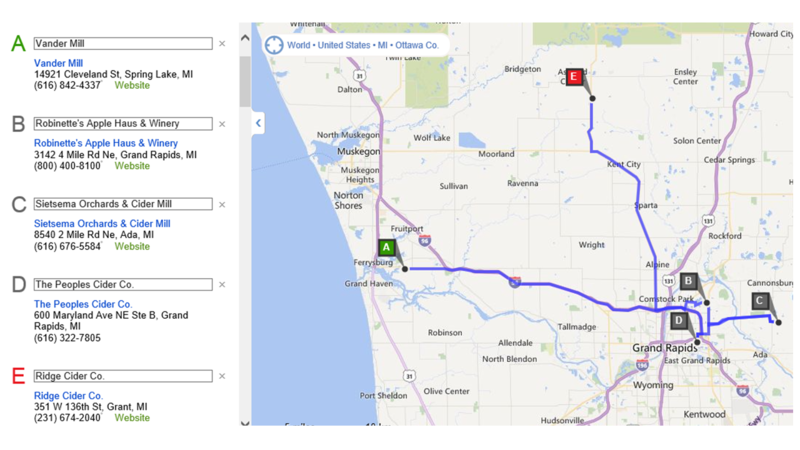 The drive to Grand Rapids from Chicago is a little over two hours mostly on the interstate. Once you get to Grand Rapids most of the cideries are a 15-30 min drive from each other. All of these cideries have tasting rooms with several only open mid-week (Wed-Sat) or late (4-9). We visited on a Wednesday and because of that and the chilly summer weather most of the tasting rooms were filled with locals. 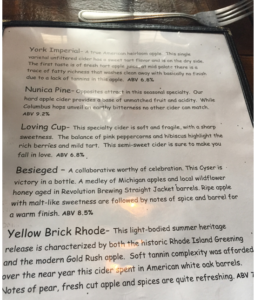 In all we visited five cideries beginning with lunch at Vander Mill and finishing with snacks at Ridge Cider Co. Along the way we met some really dedicated and passionate cider makers and had great cider. The map below (click on it to view a larger image) lists the addresses of all of the cideries and the order we visited. 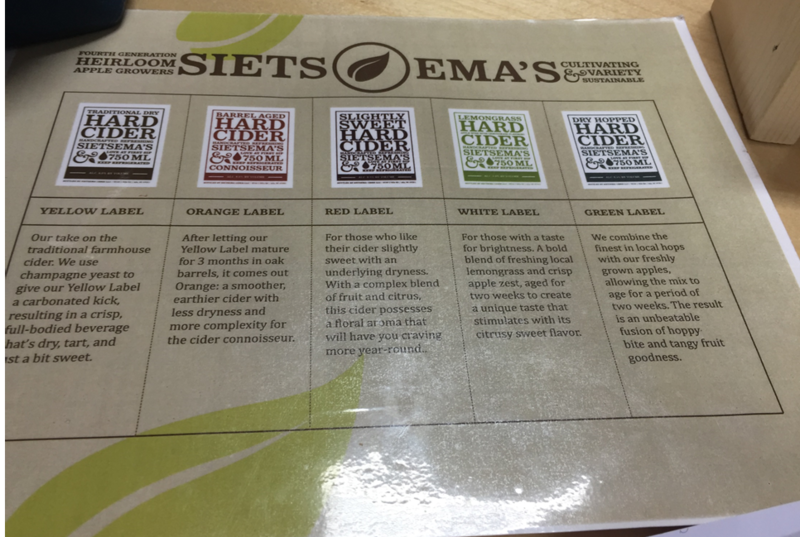 All ciders tasted were available for purchase in various formats. We started our day at Vander Mill which is one of the more well known Michigan cideries. Vander Mill’s Spring Lake location (a Grand Rapids location is set to open at the end of 2015) has a really nice lunch menu so we decided to start there for a late lunch. Vander Mill had several ciders on tap grouped into Tier 1 and Tier 2. Half of the ciders, mainly the Tier 1 ciders, are available in Chicago so we were more interested in the draft only ciders, which were on the back of our menu. We started our lunch with two flights (5oz pours of six ciders) and two Sprites for the boys. (They were out of “regular” cider because of a heavy beach tourist weekend). For lunch Sean and I had sandwiches, Crackin Chicken and Fowl Mouth, and the boys had cheese pizza (their favorite meal…they are eating cheese pizza again as I write this). The ciders nicely complemented the meal and I thought the most unique of the bunch was Loving Cup which reminded me of a hibiscus iced tea. After lunch and letting the boys burn off some energy in the attached playground, Dave, the floor manager, took us on a tour of the back of the house and production facilities. Considering its production volume Vander Mill has a very compact production floor. The move to the Grand Rapids facility will allow Vander Mill to significantly increase their production and subsequent distribution. 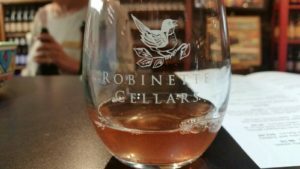 Robinettes is what most people think of when visiting an apple orchard. A farmhouse with fresh fruit, including apples and peaches, fudge, ice cream, and pastries. The tasting room was in a separate bi-level building which sold a variety of gifts from vintage metal wall signs to custom made wood-work, wine décor and accessories. Robinettes is more of a winery than a cidery however there are a number of ciders to sample. Many of the ciders start with the same base mixture and are blended with various fruits to produce the different ciders. Sietsema is a much more modern orchard. The tasting room and store front is crisp and clean with picnic tables and a small bar. Fresh fruit is for sale, including bubblegum plums – which we all thought were delicious, as well a small assortment of doughnuts. While the boys snacked on vanilla frosted doughnuts we sampled six of their ciders. Like the layout of their tasting room, Sietema’s ciders were all clean, crisp and bright. Their most unique cider was Cascara which is produced using the dried shell of a coffee bean. Since the bean was not roasted there are no bitter coffee notes, rather it is reminiscent of a green coffee bean. Sietesma has a small presence in the Chicago market and they plan to begin packaging more of their products in cans which will hopefully increase their Midwestern footprint. 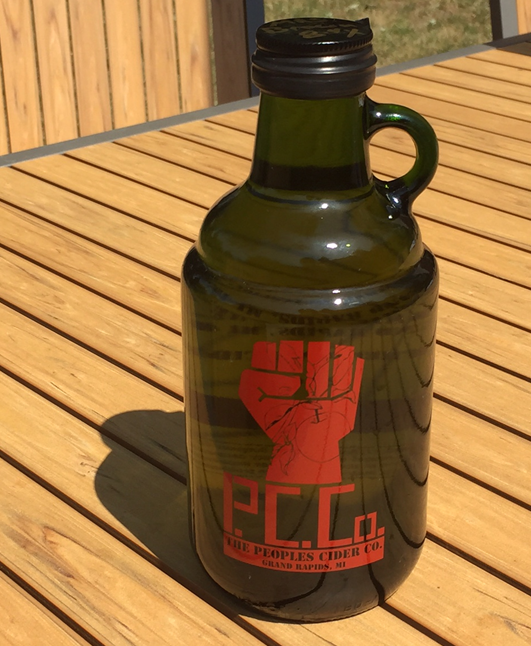 The Peoples Cider Co. is is located in a strip mall across the street from a CrossFit gym which gives it the feel of a true urban tasting room, (“This is great, after working out you can finish your night with a glass of cider” – Sean). Peoples produces three ciders, all of which are on tap. Jason, the owner, let us know the cidery is self-distributing so there is a very limited presence outside of the Grand Rapids area. Most of the ciders are aged in bourbon barrels which produces a nice warm apple flavor. 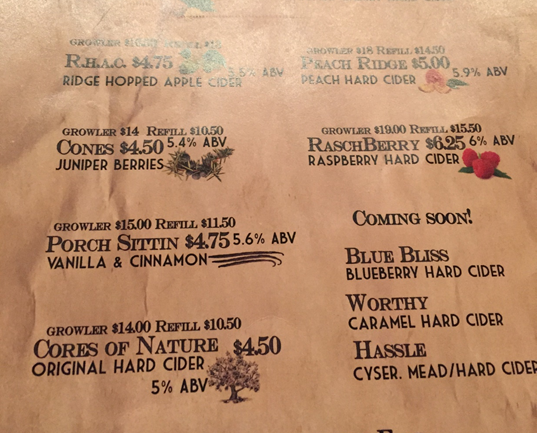 The ciders also have a higher alcohol content than most off-the-shelf ciders. Jason showed off his quaint production room which was meticulously organized with neat rows of barrels and fermentation tanks. The tasting room was small, a couple a chairs and a small bar, but the room had great energy from the locals who really loved the cider. Right away we felt like old friends sharing cider stories. The last stop of the night was Ridge Cider Co. While they didn’t have a full menu there were enough bar snacks, pretzels and chips, to keep the boys happy. (Along with apple juice, they were also out of “regular” cider.) Sean and I finished up our night with a sample of the ten ciders Ridge has on tap. Many of Ridge’s ciders are fruit focused and really highlight the natural fruit flavors. Often we find fruit ciders have a lot of extra sugar and the taste is reminiscent of jam. 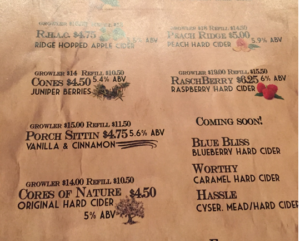 In contrast to that, Ridge’s ciders have a dry, fruit forward flavor profile. Jeff, one of Ridge’s cider makers, provided us with a tour of the production facility which is one of the larger production rooms we toured. Ridge uses apples grown on site and because Ridge does not use preservatives there is a very cold refrigeration room where many of the juices are stored (I only lasted inside for less than 2 minutes). And just as the other smaller cideries, Ridge currently has a limited footprint outside of the Grand Rapids area. Did we miss a local cidery? Email us at info@cidersoms.com with any tips, comments or questions.